The pecked red line following the course of the Little Ouse marks the county boundary of Norfolk and Cambridgeshire. 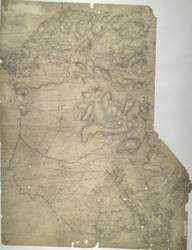 Drawn on the left of the sheet, along the Ouse Valley, is a patchwork of arable land divided by straight water-filled dykes, typical features of the fens landscape. This elaborate system of drains and river diversions was designed in the 17th century by a Dutch engineer called Vermuyden. It made possible the conversion of pasture to arable land in this region.